Multi award-winning lighting designer, Tim Routledge, chose to specify Clay Paky 800W Alpha Spot QWO 800 luminaires to deliver an intense sparkle to British singer Gary Barlow’s glittering UK tour. Routledge, known for his work with Madonna, Katherine Jenkins and Sterophonics, specified 26 powerful Alpha Spot QWO 800s, supplied by Neg Earth, praising them as ‘superb optic spots, perfect for cutting through LED’. "I specifically picked the QWO800s having used them on the Queen’s Jubilee Concert," says Routledge. "For the Gary Barlow tour we were playing theatres and smaller concert venues and I really wanted as bright a spot as I could find in the smallest body – I really dislike seeing big ugly fixtures spoiling the architecture of a show or a venue. The QWOs really fitted that bill – they are small, compact and extremely bright and moreover the optics on the focus of gobos is superb." Glyn O'Donoghue, managing director of Clay Paky UK distributor Ambersphere adds: "The super-bright Alpha Spot QWO 800 uses the latest MSR Platinum lamp, which delivers an intense sparkling light, brighter even than older 1200W lamps. The Alpha Spot QWO 800s optical features include an impressively wide zoom, ranging from 7.6° to 55°, a uniform beam distribution at all zoom angles and a unique Stay-Sharp-Zoom feature that locks images in focus while zooming. This makes it one of the most versatile fixtures in its class and absolutely ideal for a show where smooth movement and effect transitions are essential and sharp crisp bright light is paramount. "We were using a lot of LED fixtures and LED screens on the show and the Alpha Spot QWO 800s easily cut through the wash of colour – a perfect combination for me," continues Routledge. "The show wasn't effect heavy but I do like crisp beam work and also when using fine gobos such as Night Sky I was able to get great output even on a super wide focus. I wouldn't think twice about specifying them again." 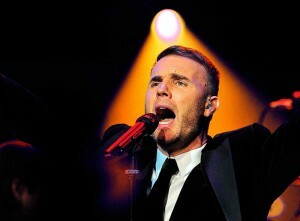 Gary Barlow – frontman of multi-million selling band Take That – toured the UK and Ireland in December and January in a solo show, visiting some of the country’s most iconic venues, including two nights at London’s Royal Albert Hall.